Game rules are an extremely important aspect for every gambler. But players should also remember the basics of roulette casino game etiquette, which makes the game pleasant to play and watch. 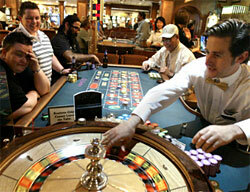 Some casinos have dress code (one should know it before going to the casino). If there are some mistakes which can lead to money losses, the players need to tell about them. Following these rather simple rules and recommendations, you will never offend other players and will spend a pleasant time, while playing.